The inductees lie on the floor, their bare feet pressed against massive subwoofers throbbing with a deep, resonant pulse. Atop the subs, trays of water vibrate, casting ripples of light across a vast ceiling: an outward representation of the powerful vibration permeating their bodies. Melbourne contemporary dance audiences have found themselves in similar ritualistic territory before in works such as Rebecca Jensen and Sarah Aiken’s Overworld (2015) or Phillip Adams’ All Things Return to Nature Tomorrow (2013), but Lee Serle’s newest work, MULTIMODAL, largely eschews cult or irony, addressing an audience’s thirst for connection with greatness directly. “Multimodal” is apt. 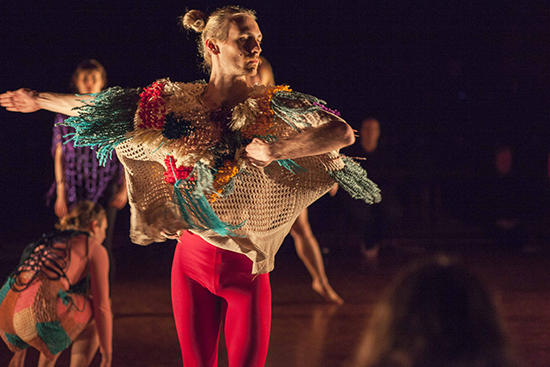 It’s an amalgam of contemporary choreography, visual art, sound installation and audience participation. Serle’s 20-strong team includes visual artist Liz Henderson, sound designer Byron Scullin, costume designer Shio Otani and 16 dancers. All the elements are significant, but the immediate, human interaction lies between the audience and the performers. 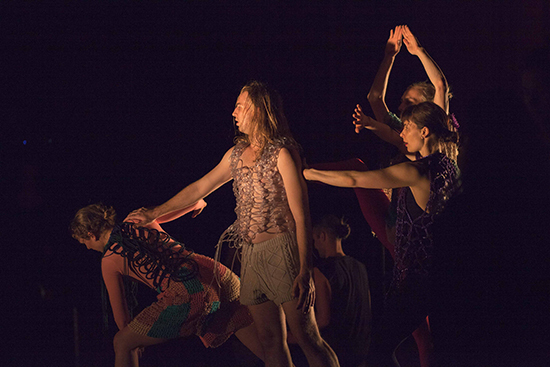 The dancers are divided in two: a chorus-like group who guide audience members, and a core of four principals—Deanne Butterworth, Benjamin Hancock, Rebecca Jensen and Geoffrey Watson. In the foyer before the performance, the principals select eight audience members who are ushered across a fragrant floor of crushed star anise to a suite of galleries (later viewable by the public). These rooms contain scented sculptures, videos, a microphone for collecting voice samples, and a naked man. Meanwhile, the remainder of the audience enters the performance space: the double-height main hall of Newport Substation. We sit in traverse arrangement, with eight empty chairs and eight dancers dressed in black on the floor before us. The dancers languidly recline, lunge and stand, turning their heads slowly from side to side. The effect of their calm, gradual movements is subtly hypnotic. Offered headphones augment the soundscape with echoes of the inductees’ sampled statements. Entering the main space, the inductees bring an assortment of mundane objects—a paper bag, a soft drink can— to a microphone, contributing to the soundscape before taking their seats within the performance. When they do, there’s a clear sense we have all been inducted into the work. A structured improvisation then heightens our relationship with the principals as they casually pace the floor, occasionally gesturing half-heartedly—a hopping shunt across the floor, an arm extension that dissolves into apathy—building to a full-blown, accelerated mash of proficient bodies hurling themselves through space. If the improv format is familiar, Butterworth, Hancock, Jensen and Watson make for an intelligent, cohesive, investigative team. All choreographers in their own right, they share an embrace of abandon: a desire to push into and fracture space. Watching, I’m struck by how, in an age of fame and social media, we look to performers of all sorts to provide a sense of personal greatness we’re reluctant to find in ourselves. Gently involving and empowering his audience, Lee Serle doesn’t allow this separation. Our proximity to the dancers is a distinct reminder of our own corporeal potential. As the improv winds down, it is replaced by intimate interactions between the four main dancers and their subjects. The dancers hover unusually close. Ben Hancock’s grounded nearness has a kind yet disquieting ambiguity. The inductees are moved and interviewed by the secondary group of dancers. In the performance I witness, simple questions about the inductees’ experience in the galleries below yield intimate reflections on grief and loss. Their shoes removed, they lie on the floor in contact with the speakers. Transitions are handled smoothly and it feels natural to arrive at this final sequence. Byron Scullin’s throbbing soundscape takes over, and the whole audience seems to have entered an altered state, mesmerised by the vibration generating ripples of light across the ceiling. Lee Serle & The Substation: MULTIMODAL, The Substation, Newport, Melbourne, 30 Aug–4 Sept; read the program here.